Nigeria sports minister Bolaji Abdullahi has told football authorities to revoke the contract of national technical director Tom Saintfiet. Back in March, the Nigeria Football Federation (NFF) offered the Belgian a four-year deal. But Saintfiet, who has previously worked in Namibia, Zimbabwe and Ethiopia, has yet to sign a deal, citing difficulties in securing a Nigerian work permit. Abdullahi has now directed the NFF to appoint a local to do the job. JUlius Ogunro, special assistant to the sports minister, said in a statement that Abdullahi felt the decision was necessary. Ogunro added that there are many competent Nigerians who have strong knowledge of grassroots football in the country and are better suited for the role of a technical director. Meanwhile, the NFF spokesman Ademola Olajire confirmed that top officials met with the minister and discussed Saintfiet's role. "There's really nothing for us to say from our end but expect the board to make an official statement with regards this," Olajire told the BBC. 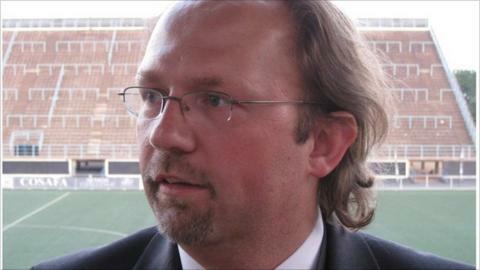 "Yes there was a discussion between the minister and the NFF concerning the technical director role. "There will be an official statement from the NFF very soon." In a communiqué signed by NFF executive committee member Emeka Inyama, Saintfiet was expected to earn a monthly salary of US$20,000. As part of his brief, the 39-year-old was expected to oversee all the country's teams.